Today is Jesusfreakhideout.com's ninth birthday! Thanks to everyone for their support through the years! Here's to many more! It may be somewhat quiet in the Third Day camp these days, but that doesn't mean the band has been inactive -- quite the contrary actually. 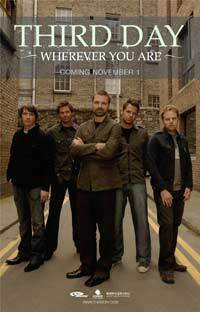 Although details are scarce, the boys from Atlanta are gearing up for a brand new studio album releasing November 1st called Wherever You Are! Click on the image below for a Jesusfreakhideout.com exclusive look at the first ad for the album! More info on Wherever You Are coming soon!